The GlobalDairyTrade price index increased by 3.4% in this morning’s auction. 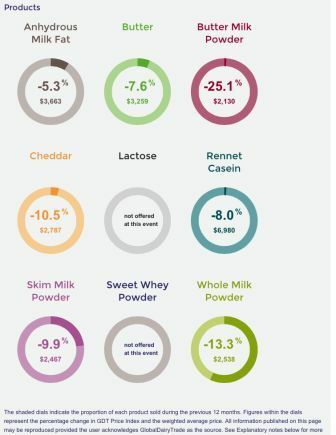 However, whole milk which has the biggest influence on the farm gate price, dropped 1.7%. The tap has officially been turned on for one of the country’s largest irrigation projects. The Central Plains water scheme will irrigate more than 20,000 hectares of Canterbury farmland. One Hororata farmer says the massive scheme, which runs off the Rakaia River, will enable him and his neighbours to completely transform their operations. Rodney Booth has waited a long time to turn the irrigators on at his Hororata farm. . .
New Zealand earned $2.3 billion more from exports than we spent on imports during the year ended June 2015, Statistics New Zealand said today. In the year to June 2015, total exports of goods and services were $67.5 billion, while total imports were $65.1 billion. Dairy remains New Zealand’s largest export commodity, earning $12.0 billion in the June 2015 year. However, this was down from $15.8 billion in the June 2014 year. Spending by international visitors to New Zealand (travel exports) increased $2.4 billion, reaching $11.7 billion in the June 2015 year. “Dairy and travel are New Zealand’s biggest export earners,” international statistics senior manager Jason Attewell said. “A fall in dairy exports to China, combined with the increase in expenditure by overseas visitors to New Zealand, has narrowed the gap between the two.” . .
Brice Horner gets a buzz about educating others about beekeeping. Now the Dunedin police officer has developed a phone app that helps beekeepers identify whether they have the destructive bacterial disease American foulbrood (AFB) in their hives. AFB kills bee larvae and infected hives have to be destroyed by burning, as the disease is very difficult to combat. After destroying the bee larvae, spores could survive outside a bee colony for more than 35 years. It is a serious issue, and beekeepers are legally required to advise the AFB Management Agency within seven days of noticing an outbreak and to destroy the disease by burning within the same period. . .
(BusinessDesk) – New Zealand dairy farmers bracing for the lowest payout in a decade probably won’t welcome the latest analysis of global trends in the industry – their counterparts in every other dairy-producing country are being paid more. An expected uplift in dairy prices in the overnight GlobalDairyTrade auction won’t change the fact Kiwi dairy farmers are the lowliest paid. AgriHQ analysed milk prices from around the world converted to NZ$/kilogram of milk solids to allow valid comparisons, although some dairy farmers incomes in other countries are boosted by subsidies and support schemes. 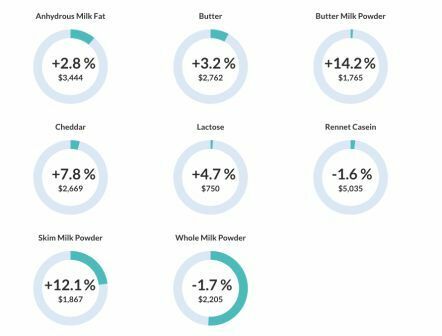 Fonterra’s forecast farmgate milk price, which is the price setter in the New Zealand dairy industry, is $3.85/kgMS for the current season, the lowest in a decade. That compares to China at the other end of the scale at $11/kgMS, the United States at $8.15/kgMS, Argentina at $7.57/kgMS, and the UK at $6.95/kgMS. Of the countries analysed, Ireland’s payout of $6.10/kgMS was the closest to New Zealand’s. . .
(BusinessDesk) – OceanaGold Corp expects 2015 production to increase while costs fall after the gold miner takes control of Waihi Gold Mine later this year. The acquisition of the Waihi mine from Newmont Mining Corp is awaiting approval from the Overseas Investment Office this month, and once completed, OceanaGold expects to assume the economic benefits and costs associated with Waihi from July 1, the Melbourne-based miner said in a statement. The company increased its 2015 production estimates, and reduced its costs forecast to reflect lower copper and diesel prices and a weaker New Zealand dollar, it said. . .
(BusinessDesk) – Sanford, New Zealand’s largest listed fishing group, will quit its underperforming Pacific tuna business and put the unit’s fleet up for sale. The Auckland-based company sold its San Nanumea vessel and is in talks with a potential buyer of San Nikunau, its other Pacific tuna ship, after reviewing the viability of the business, Sanford said in a statement. On April 9, it entered into a conditional agreement to sell both international purse seiner vessels, according to Sanford’s interim report released in June. . .
(BusinessDesk) – Rural Equities, the farming group majority-owned by the Cushing family, posted a 27 percent decline in annual earnings as milk prices plummeted. The Hastings-based company said operating earnings before interest and tax fell to $4.67 million in the year ended June 30, from $6.43 million a year earlier as Fonterra Cooperative Group slashed its milk price payout to $4.40 per kilogram of milk solids from $8.40/kgMS the previous year. While that impacted its seven dairy farms, the company said its Waikato Puketotara sheep and beef property had a record year and it had steady income from leasing 15 of its 25 farms. “Operating earnings were satisfactory given the substantial reduction in milk price,” said executive chairman David Cushing. “The company’s portfolio, with a mixture of directly operated and leased farms and diversity by property type and geography, helped provide balance.” . .
An $89,700 grant from the Community Environment Fund for the restoration of the Whangawehi stream on the Mahia Peninsula was announced today by Environment Minister Dr Nick Smith during a visit to the catchment. “New Zealand has a major challenge to improve the management of our waterways, which has to be achieved stream by stream, river by river and lake by lake. The key to the success of these restoration programmes is getting all parties – landowners, iwi and hapū, district and regional councils as well as the Government – working together. This has been achieved on this project and that is why the Government is providing funding support,” Dr Smith says. . .
Fonterra farmers can now apply for Fonterra Co-operative Support, a loan to help them deal with the current challenging conditions. Chairman John Wilson said Fonterra is well placed to help its farmers because of the Co-operative’s underlying strength. “Being able to help our farmers is all about standing together as a Co-operative and using our collective strength to get through these tough times,” said Mr Wilson. “We have had a lot of interest from farmers who appreciate what the Co-operative is trying to do for them to assist them with their farming businesses in a tough financial climate, and we are anticipating a large number of applications.” . 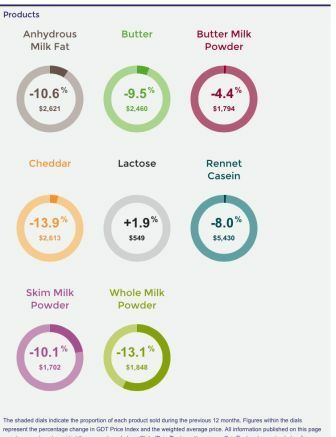 . .
More bad news on the dairy front this morning with a drop of 10.7% in Fonterra’s GlobalDairyTrade price index. Fonterra’s board will review the forecast milk price next month. It won’t be going up and could well go down. The dollar fell to a fresh five-year low in the wake of the GDT result. The kiwi touched 65.81 US cents, and was trading at 65.92 cents at 8am in Wellington, from 67.05 cents at 5pm yesterday. The trade-weighted index sank to 70.01 from 70.88 yesterday. 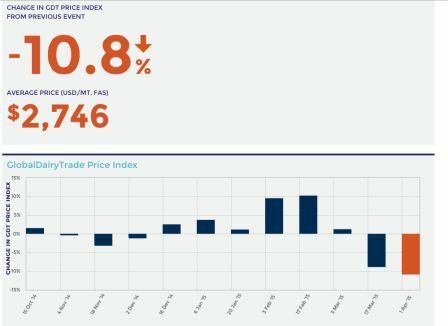 The New Zealand dollar dropped sharply after dairy product prices sank an average 10.7 percent to a six-year low in the GDT auction, with the key whole milk powder price dropping 13.1 percent to US$1,848 a tonne. Dairy prices have remained lower for longer amid higher global supplies in New Zealand, Europe and the US, weak demand in China and an import ban in Russia. The weaker prices come as New Zealand production is rising heading into the country’s peak supply period in October, raising concern about the impact on the nation’s economy. . .
We can be grateful we have our own floating currency and aren’t like Greece which is tied to the Euro. 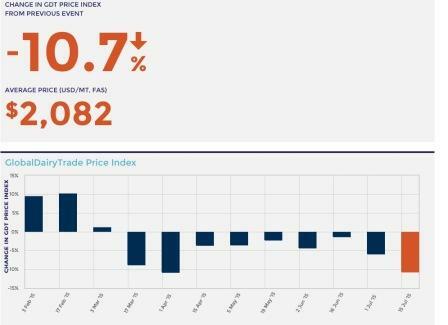 The GlobalDairyTrade price index dropped 10.8% in this morning’s auction. This isn’t cause for panic but it is cause for caution. The dairy market is volatile. The cut in Fonterra’s payout isn’t good news but it isn’t the disaster that many are proclaiming. Just four days after the General Election the true state of the dairy industry is revealed – returns for milk that the New Zealand economy is reliant on have slumped. “Questions need to be asked by New Zealand voters on why they were not informed about this serious decline before Election Day,” says New Zealand First Leader, Rt Hon Winston Peters. “The drop in payout is a $5 billion hit to the New Zealand economy and 2 per cent off nominal GDP. “It appears the government and Fonterra joined forces to keep the facts hidden from voters? . . .
Fonterra makes announcements on its previous season’s final payout and any revision to the current one at this time every year. The record final payout for last season was no surprise. Nor was the cut in this season’s forecast. 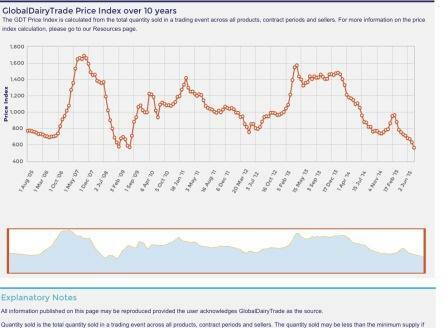 Anyone with even cursory knowledge of the global milk market was expecting it after successive drops in the GlobalDairyTrade price index and with the knowledge that the milk supply here and around the world was outstripping demand. Lower income will impact on farmers, those who service and supply them and the wider economy but the news isn’t all bad. The value of our dollar fell after Fonterra’s announcement which will help all exporters. Rabobank New Zealand CEO Ben Russell said the softening in overall rural confidence was clearly a reflection of the impact of the bearish global dairy outlook and lower milk prices on dairy farmer sentiment. “Falling dairy commodity prices are the overwhelming factor at play here. 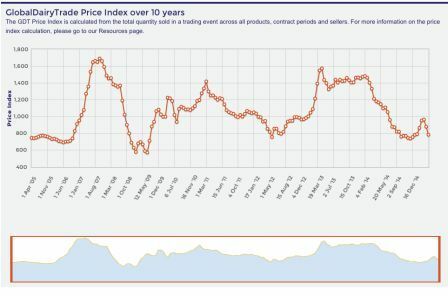 At the time of the survey being taken, the globalDairyTrade auction prices fell six per cent, taking them down 45 per cent from their February peak,” Mr Russell said. “And with global dairy supplies continuing to increase from all key exporting regions, a significant price recovery is not imminent. Mr Russell said dairy farmers were also cautious with the dairy industry approaching a critical time in the year, with the peak production and selling period for New Zealand milk just weeks away. The dampened confidence among dairy farmers was reflected in their business performance expectations in the coming 12 months. Dairy farmers had the most pessimistic outlook of their own farm business performance. However, Mr Russell said, it should be noted this was coming off record highs for business performance expectations among dairy producers over the past 12 months. The latest survey found almost half of dairy farmers surveyed (47 per cent) expect the performance of their own farm business to worsen in the coming 12 months, up from 30 per cent with that expectation in the previous quarter. Just 20 per cent expect an improvement in performance, compared with 27 per cent previously. A total of 32 per cent expected performance to remain stable. While there was also a tempering in sentiment among beef and sheep farmers, after reaching three-year record highs in the previous survey, confidence in this sector remained at overall strong levels. Mr Russell said lamb prices were up on the previous season and beef prices were currently hitting record highs due to tight global supply. In terms of expectations of their own businesses, the number of beef and sheep farmers expecting improved performance declined from 57 per cent last quarter to 48 per cent this survey. However, the percentage expecting their farm business performance to worsen remained stable, at just seven per cent. A total of 42 per cent anticipated business performance would remain at the same level. Despite the decline in overall confidence, New Zealand farmers’ investment intentions were overall stable, the Rabobank survey showed. Sheep and beef farmers increased their investment appetite – with 43 per cent indicating they intend to increase investment in their farm businesses over the next 12 months, up from 37 per cent previously. Only six per cent intended to decrease investment (compared with four per cent in the past quarter). For dairy however, investment appetite had waned, with 21 per cent intending to invest less in their businesses (up from just seven per cent with that view in the previous survey) and 20 per cent expecting to increase investment (down from 27 per cent). This was the lowest level of dairy farmer investment intentions in more than five years (since August 2009). Mr Russell said this change in sector investment dynamics may be an early indication the decline in the national sheep flock and the rate of dairy farm conversions were slowing. . .
Fonterra Cooperative Group farmer shareholders will welcome confirmation that the 2013/14 season has ended exactly as promised with a total payout of $8.50 per kilogram of milksolids (kg/MS). That good news is balanced by a sharp revision downwards in the 2014/15 forecast. “The 2014/15 season which offered so much has turned into a breakeven one for not just Fonterra suppliers but the entire industry,” says Andrew Hoggard, Federated Farmers Dairy chairperson. “Like Synlait’s revision this week, there is a ‘good news and bad news’ dimension in this. The good news is that we take the 2013/14 confirmed payout and the lowest revised forecast for 2014/15, we are talking an average total of $7kg/MS across the two seasons. “A $5.30 kg/MS milkprice is also a lot higher than some commentators had expected if the forecast sticks. If being a little word with a big meaning. “Losing 70 cents kg/MS on the milkprice is really going to hurt. Farmers will be kicking capital works into touch and will be pruning herds to rid themselves of any passengers. “Speaking to DairyNZ, farm working expenses this season, before depreciation and interest payments, are expected to be around $4 kg/MS this season. Feed, fertiliser as well as repairs and maintenance are going to be cut back. We’ll only do what needs to be done. “What we know from DairyNZ is that two-thirds of dairy farms have working expenses of between $3.25 and $4.75 kg/MS. Of course when you start paying back the bank manager, the average cash costs on-farm head up to $5.40 kg/MS. “As you can tell from what the forecast currently is, the current surplus is a wafer thin 15 to 25 cents kg/MS. Expressed as retail milk, that’s about 1.25 to 2 cents a litre this season. “It means that upwards of a quarter of our guys will be making a loss this season. “We also believe that unlike the Global Financial Crisis, dairy farmers have been listening and have focussed on building financial freeboard. Sadly for some farmers, they’ll have to dip into that big time. “Federated Farmers’ advice is to watch costs but to keep your bank, farm consultant, accountant and family fully in the loop. Take a no surprises approach to get through. “This season has been a perfect one for global milk with ideal conditions everywhere compounded by civil unrest in the Middle East and dislocation of European milk due to what is happening in Eastern Ukraine. “We can only hope there is no more bad news but I am optimistic we may be back above $6 kg/MS for 2015/16,” Mr Hoggard concluded. Agricultural prices are always cyclical. Dairy farmers creamed it last season, now it’s sheep and beef farmers who have a brighter outlook. Both know that what goes up comes down and what comes down goes up again, sooner or later.